Emergency services at a Cheshire hospital have "deteriorated" since the last inspection, inspectors have said. The Care Quality Commission (CQC) carried out an unannounced assessment of Warrington Hospital's A&E department on 18 February after a previous visit two years earlier. They found it was in need of "significant and swift improvement". 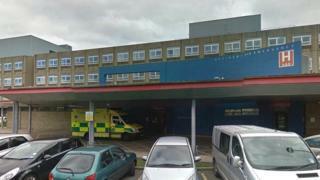 Warrington and Halton Hospitals NHS Foundation Trust said it would improve in "short order". A CQC spokesman said the inspection was "unrated", meaning the trust's overall rating remained as "requires improvement". The department, which treats about 80,000 patients a year, had been rated "good" in March 2017. The inspectors found that a lack of available beds led to patients being cared for in the corridor and a shortage of doctors and nurses meant some patients faced "excessive" waits of more than two hours to be triaged. Inspectors also found that on occasion, ambulance crews were left waiting to hand over patients and on-call specialist doctors were slow to respond. The report said staff had concerns about patient safety but spoke positively about working there, while the leadership team were seen as "energetic" and "working well together". The trust's chief executive Mel Pickup said three nursing vacancies had been filled since the inspection, but the "aging estate", which was built in the 1970s, was designed to treat 200 patients a day and now treated up to 100 more than that. She said the report emphasised the need for a planned "new purpose-built hospital" to be built as soon as possible.